Yoga at home Wimbledon – private yoga lessons in Wimbledon, Southfields, Putney, Wandsworth, Barnes and Fulham. Welcome to 121 personal training – we provide 121 yoga lessons to our clients at their own homes in South West London. Learn yoga at your own home at times to suit you. Call us today on 0788 188 4738 to arrange your trial yoga session at home! Whether you’re new to yoga, an experienced practitioner or are simply looking to recharge and tone your body, you’re in the right place. Are you too busy with family and work commitments to get to the gym or a yoga class? Or are you a busy mum who would prefer to practice at home rather than having to make complicated childcare arrangements? At 121 Personal Training we can help – we bring the yoga class to you! Our team of yoga teachers visit you at your own home – at times to suit your schedule. We bring all the equipment for your private yoga classes which are combination of postures, breathing techniques and relaxation. Best of all, with our Yoga at Home Wimbledon packages, you can share your classes with a family member or friend at no extra cost! No contracts – no sign up fees – no monthly standing orders. Your private yoga at home Wimbledon class will be tailored to your individual goals, experience level and current fitness level. We provide a full range of yoga services at home – including yoga for couples, Hatha yoga, fitness yoga and yin yoga. Our friendly and experienced yoga teachers specialise in introducing beginners to the many benefits of yoga. We also help clients who suffer from back pain and lower back pain. Try our summer yoga deal – book a block of 6 or 12 yoga lessons and get 1 lesson completely free! Call us today on 07881 884 738 to arrange your trial yoga lesson at home! This offer is valid for new client bookings in May, June and July 2017. 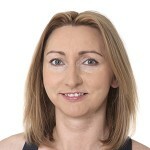 Magda is a YMCA qualified Hatha yoga teacher and a Premier qualified nutrition coach. She specialises in providing private yoga lessons and nutrition coaching for individuals and small groups in SW London.